Obama's Shift On Syria: A Show Of Strength Or Fear? : It's All Politics In the face of congressional and popular resistance to his call for retaliation against Syria, the president had a conversion on the missile flight path to Damascus. But what constitutes presidential wisdom and strength in today's global politics? It may have less to do with traditional notions of strength and more to do with vision and adaptability. 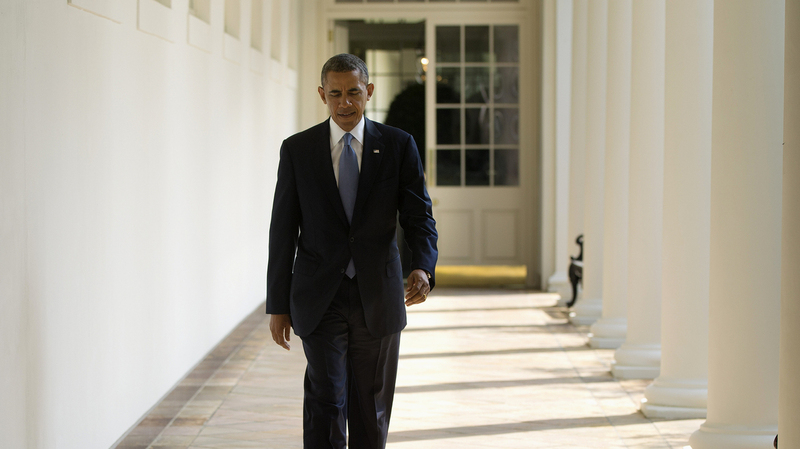 President Obama walks along the West Wing Colonnade toward the Oval Office ahead of Tuesday night's speech on Syria. One line President Obama might have borrowed for his speech to the nation Tuesday night was a famous one from John F. Kennedy's inauguration address: "Let us never negotiate out of fear, but let us never fear to negotiate." Always admired as a fine turn of phrase, what meaning does this have in our own time? Perhaps it might have helped Obama make the turn from indicting the Syrian regime's alleged use of chemical weapons to explaining why he backed off his own earlier threat of military retaliation against Syria. Back in 1961, Kennedy and his speechwriter, Ted Sorensen, were seeking a balance between resolute strength (Kennedy the war hero) and openness to the promise of a more peaceful future (Kennedy the visionary). They wanted the new president to be tough enough for the Cold War and imaginative enough to see beyond it. In fact, in his brief presidency, Kennedy led the nation into a series of confrontations with the Communist bloc: the Bay of Pigs, the Berlin Wall, war in the Congo, the Cuban missile crisis and the early escalation of commitment in Vietnam. In each case, Kennedy was reasonably sure he could count on support from Congress and the public, in part because very few people would know what was actually going on. Obama faces his current Syrian conundrum with no such assurance. If he can count on anything, it's congressional and popular resistance. The Senate might be persuaded to back a military option by the narrowest of margins, but the House has made its opposition as plain as could be done without a recorded vote. Moreover, Congress' attitude reflects that of the nation itself. Rarely has Congress been quite so attentive to its constituents, who in turn have rarely been so lopsided in opposing a war. Even many who believe Syrian President Bashar Assad is guilty as charged do not favor intervention. And the percentage of those supporting even limited air strikes has actually declined since the crisis began in late August. The specter of "another Iraq" looms over everything. The public generally sees no vital national interest at stake in Syria, and the public doubts that any "limited strike" would remain limited. Obviously, much has changed since Kennedy and Sorensen tried to touch the American psyche. But above all, we have had half a century of intermittent wars, some brief and some seemingly interminable. The achievements of these conflicts have been, in the end, highly debatable, and the costs are quite real. The damage to the national psyche has been incalculable. Many of us think of these episodes and recall serial presidential speeches about backing up our national "ideals and principles" with a temporary action on a limited scale. Where are we now in the Syria saga? Are we negotiating out of fear? Not out of fear of the Syrians, to be sure, or their Russian backers. The era of our fearing the "Soviets" or the "Empire of Evil" has passed. The fear now is of unintended consequences, including muddled engagements with casualties and confounding results. So it makes sense for the White House, despite all its protestations, to fear defeat in the Congress, or at least in the House. You might say the president has less to fear from Assad or Russia President Vladimir Putin than from Reps. Michele Bachmann (R-Minn.) and Barbara Lee (D-Calif.), outspoken women who anchor opposite ends of the political spectrum in the House — and who both oppose a military strike against Syria. It is that alliance of left and right, of peacenik and libertarian, that threatens to give this president a beat down heard 'round the world. And that is why this president had a conversion on the missile flight path to Damascus. So what is presidential wisdom and strength in the global politics of our new century? Is it the president who's weak when even those Americans who hold Assad a war criminal do not wish to make war on him? When only a handful of lawmakers on Capitol Hill are willing to face this tide of voter sentiment and explain that Syria is not Iraq or Afghanistan? Perhaps what a president needs now to be successful in foreign relations has less to do with traditional notions of strength and more to do with an array of skills such as inventiveness, imagination and adaptability. At least we know this much: Showing conventional might has become, as often as not, counterproductive. And being out of ideas and imagination is as much a state of weakness as being out of soldiers and ammunition.